From the 1960's on, the LBBG complex has received great interest. Several studies in the field and from museum specimen have been executed. Until recently, most writers supported the general idea of a clinal change from west to east. On the islands of the U.K., Iceland and the Faeroes, the race graellsii occurs. Graellsii is obviously different from fuscus in mantle colour (paler grey), wing dimensions (wing length plotted against bill length), bill dimensions (graellsii being blunt-billed, measured by bill height/length) and egg dimensions, together with timing of egg laying date (all from Barth, 1967-1968 ~ page not available). Nominate fuscus occurs in the central and northern Baltic area and in the northern part of Norway. In general it is very dark mantled (black-grey) and mantle feathers show more chroma (brownish hue). In between, i.e. southern Norway and Denmark, an intermediate form, intermedius occurs. It seems reasonable to believe they are a result of interbreeding (intraspecific hybridisation) between pale graellsii and dark fuscus. 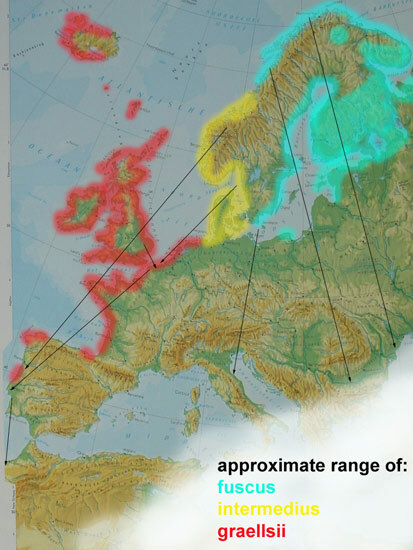 Within a couple of decades intermedius and graellsii interbreeds started to occupy new sites along the West-European coast from Denmark southwards (although some sources mention them to be graellsii, intermedius only being a common visitor on migration). It's an ongoing process, resulting in new colonies already as far south as Portugal. The populations at Iceland and the Faeroes seem to show much resemblance with graellsii and it's believed the LBBG's seen in the U.S. belong to this race as well. Nevertheless, ring recoveries show that first winter LBBG's born in Dutch colonies (often referred to as Dutch intergrades) turn up in the U.S. as well. Especially since the 60's, graellsii and intermedius populations have expanded rapidly, while the fuscus population has decreased. For years, the contact zones of intermedius and fuscus could be found at central Norway (just north of Möre, where nevertheless pretty pale grey specimens were collected) and in Denmark (where it is impossible to distinguish, on sub specific level, between either the Danish sample and the Baltic one or between the Danish sample and the intermediate sample from e.g. the Netherlands). On the island of Anholt, several 100s of breeding LBBGs were found in the 60's; their characteristics varying from 'typical graellsii', 'typical fuscus' and the intermediate form corresponding with intermedius birds. The map shows the approximate ranges of fuscus, intermedius and graellsii, as the late Edvard Barth classified LBBG's after intensive field research. Already in the 60's, Barth proposed to treat intermedius as a subspecies, or at least classify it closer to graellsii than to fuscus. Apart from coloration and biometrics, graellsii and intermedius are different from fuscus in egg laying date and migration pattern, where fuscus clearly differs from the intermedius/graellsii group. Ring recoveries revealed fuscus to migrate S and SE, where main groups of intermedius catches up with graellsii on their migration SW to Portugal and further south along the NW African coast. Birds from South Sweden migrate south, at least a part of the population can be found in E Germany and further south in S Italy on migration. Probably the birds from Öland (which have been recorded flying SW) meet birds from Denmark on the way to S Italy and further south into Africa. Much what is written on this website deals with LBBG's seen at our local patches in the Netherlands. Most pictures were taken at these locations as well. 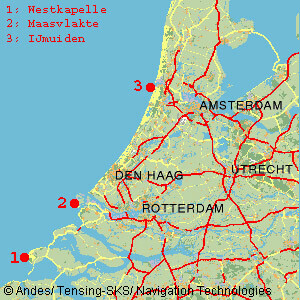 Click on one of the numbers in the map to get a more detailed map of the locations Westkapelle, Maasvlakte and IJmuiden. Westkapelle is a place to study gulls from short distance, especially from September to December. 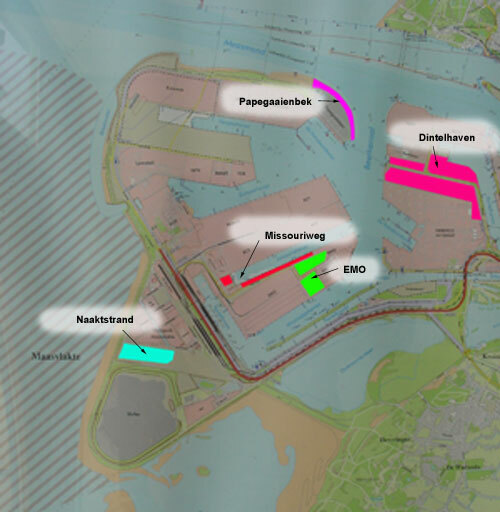 Near Rotterdam, in the industrial Europoort complex, large Lesser Black-backed Gull colonies raise their pulli from April to August. Near Amsterdam, the fishing harbour of IJmuiden has extensive sandy beaches with large shell-banks where groups of several 1,000's of large white-headed gulls forage in winter. Year round, the direct surrounding of Boulogne-sur-Mer is a very interesting place to search for white-headed gulls, especially Yellow-legged Gulls. 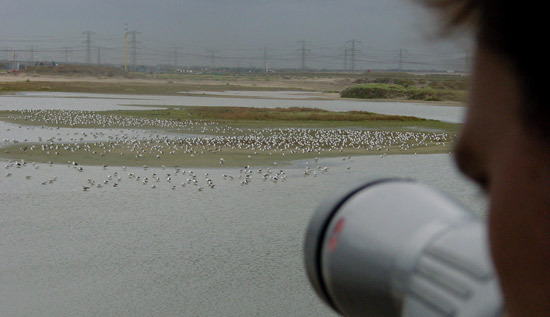 Boulogne-sur-Mer and the banks of the river Canche at Etaples host several 100's of gulls and make this place the northern-most area in Europe to study michahellis on a large scale. NW France is only a four hours drive from Amsterdam. Click the thumbnail of the map for the Le Portel / Boulogne-sur-Mer locations and some background information. IJmuiden and Maasvlakte both hold large colonies of LBBG's; Westkapelle in the 'far' SW of the Netherlands is favorite for spending the months mid-September to November by Scandinavian LBBG's from S Norway, Denmark and SW Sweden. It should be noted that the largest part of research on the moult proceedings of LBBG has been done on the Naaktstrand. This place, a freshwater pool immediately next to the beach is used as stop-over by breeding birds returning from the sea. They stay here for only a short period, they preen and move on to the colony. The nearest colony is situated 1 km from this pool. During the day, numbers fluctuate with high numbers during morning and late in the afternoon. Birds then return from their night-hunt on sea. In the late afternoon, birds gather here to wait for the sunset, the moment they will fly out to sea to hunt on surface-prey. This stop-over is also a good place to scan migrating LBBG's, colour-rings indicate birds originate from Belgium, England, Scandinavia and the Netherlands. 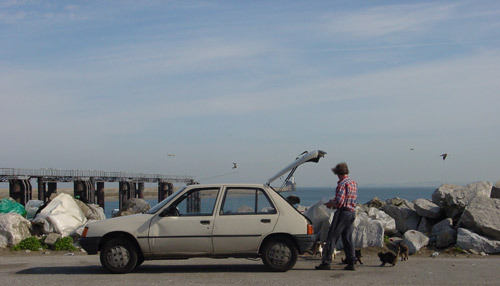 But some Pontic Gulls were discovered here originating from Croatia and the Ukraine. Main differences between graellsii/intermedius and the Baltic fuscus are arrival at the breeding grounds, first date for egg laying and migration pattern. Fuscus is tied to another annual pattern or time-schedule than intermedius and therefore is bound to another moult pattern, as described by Jonsson in (BW 11-8, 1998). But if there proves to be overlap in migration distance, weather conditions on the wintering grounds, etc. this may raise expectation of overlap in features of fuscus and intermedius as well. Subsequently, we may find clues to explain similarities in fuscus and intermedius in say "arrested primary moult", "moult sequence in the retrices and secondaries", etc. We would like to plot the bulk and extremes of ring-recoveries in a world map for fuscus, graellsii and intermedius. These data can either refer to metal ring and colour ring projects. It is necessary to say that many LBBG ring-codes are read while the birds are still on the move, only indicating their path to or from the wintering grounds. And certainly, ring-recoveries show the best visited places by birdwatchers, which are not necessarily the same as the main wintering grounds. Chroma: the 'saturation strength' from grey (0) to the 'pure' colour (16) in decimals steps. The Munsell value therefore can be read as hue/value/chroma. It's interesting (and highly recommended) to read the results from his various samples from as far north as N Norway, west from the U.K. and the Faeroes and of course Sweden, Finland and Denmark. In general, it is possible to distinguish between graellsii, intermedius and fuscus on a population level, but it is definitely very hard to allocate individuals to races. Populations vary from almost black (in SW Finland), becoming slightly paler in N Norway, Götland and S Sweden and in general become paler grey, where the palest grey LBBGs are found in isolated colonies at Faeroes and the British islands. What is said about grey tone, applies more or less in a same extend to the Munsell value, the reflection value or as we used it in these web pages 'brown hue' of different LBBG populations in W Europe. Click here for Grey-scale and Colour charts.